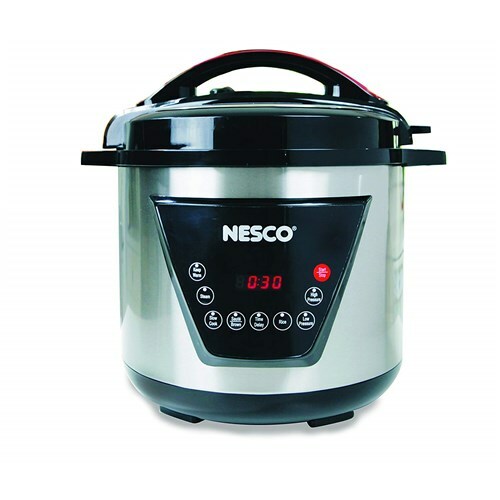 The Nesco PC8-25 is a 8-quart Multifunction Pressure Cooker allows you to pressure cook, brown, saute, slow cook, steam and make rice. It comes with a cooking rack, measuring cup, spoon, and condensation drip cup. The programmable digital timer can be set to delay cooking. The pressure cooking preserves flavors and nutrients, and speed cooks inexpensive cuts of meat into great tasting meals. The Nesco Multi Function 8 Quart Pressure Cooker has many exciting features for users of all types. You can extend the lifetime of your Nesco Multi Function 8 Quart Pressure Cooker with the purchase of a FactoryOutletStore Factory Protection Plan. 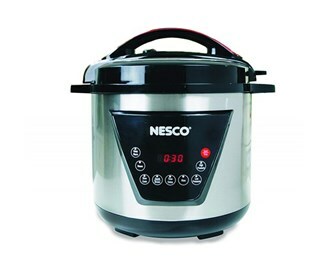 See the Nesco Multi Function 8 Quart Pressure Cooker gallery images above for more product views. The Nesco Multi Function 8 Quart Pressure Cooker is sold as a Brand New Unopened Item.